Who would say no to a prettier smile? Thanks to cutting-edge technology and innovating cosmetic dentistry procedures, most patients can get the smile they want. 1. 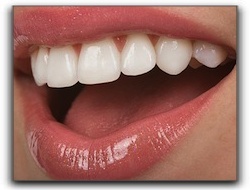 Teeth whitening lightens and brightens yellow or discolored teeth. This popular, quick and easy procedure is usually done in the dentist office, and the results can be surprisingly dramatic. 3. Tooth reshaping improves the appearance of teeth. This simple procedure involves removing part of the enamel and can be used to fix small chips or to change the length or position of teeth. 4. Veneers are thin, custom-made porcelain coverings. They are bonded to the teeth and can be used to close gaps or cover discolored teeth. 5. For most, dental implants are the best way to fix a missing tooth. 6. A smile makeover uses a combination of the available treatments to get dental patients the smiles they want. If you are in the Sugar House, Millcreek, or Holladay area and are in need of dental care or have cosmetic dentistry questions, please give us a call at 385-299-7840 .